MD ECO: Students caring for our local natural places. This year Mount Doug’s Environmental Club, MD ECO, collaborated on Environmental Education, Shoreline cleanups and ecosystem restoration projects. Grade 10 students Sam Munn and Josh Lin organized a series of lunchtime lectures from experts in the community. Professor Brian Starzomski spoke about biodiversity focusing on the BC Central Coast, biologist Andy McKinnon described the interactions of fungus in forest ecosystems, Dr. Kendrick Marr led a hands-on workshop on plant identification, Bryce Gilroy-Scott discussed sustainable housing in Canada and James and Kristen Miskelly spoke about growing native plants from Gary Oak ecosystems and helped with identification of plants being grown on Mount Tolmie. Colin Johnson, Caitlyn Wiltsie and Emma Wang made colourful posters to advertise the events. Thanks to Rampac for funding to support costs for bringing some of these speakers in to work with Mount Doug students. Jenny Yu organized a workshop from the Compost Education Center to assist students in harvesting compost made from the worm farm in room 219. Sophie Collins and Inez Verdun continued as caretakers in the second semester. Sophie and Inez also spoke on behalf of Youth at the Earth Day March for Science on April 22nd at Centennial Square. Mount Doug students did Shoreline cleanups at Mount Douglas beach in the fall and spring and will continue to do so in the next year, so please come out and join us! MD ECO and many Science 10 and Biology 11 classes continued their invasive species removal and restoration work on Mount Tolmie over the entire year. Students worked through rain, hail and snow in this unusual year to clear areas of English ivy, blackberry and toxic Daphne plants. The grade 10 challenge science students continued working on their experimental restoration plot by testing different treatments and looking at the germination and growth of native seeds over the springtime. Students were working even after school was done this year to set up next year’s experiment by doing more treatments and collecting some native seeds to sow in the plots from the Garry Oak Meadows. Funding for this project came from the Lieutenant Governor’s Stewards of the Future program and 10 Mount Doug students were selected to attend and present at a weekend conference looking at sustainability and environmental Futures with her honor at Camp Elphinstone in Gibsons in early June. 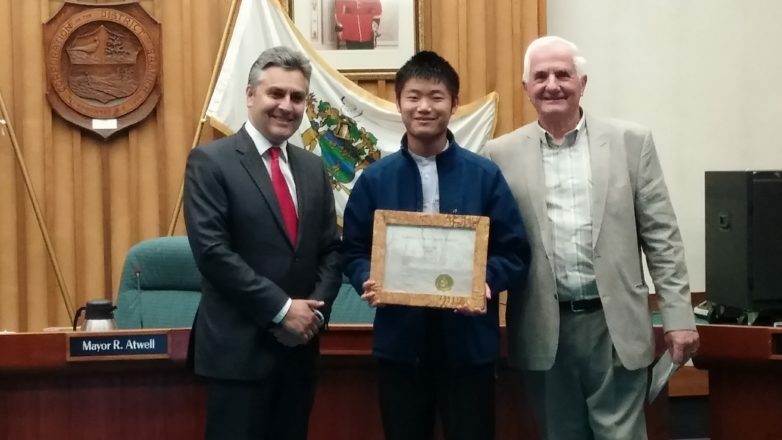 Grade 11 student Ocean Han was recognized for his four-year and counting weekly commitment to removing invasive plants across Victoria with the Saanich Environmental Youth Award for 2017. A special shout out to the graduating grade 12s who came out over the years to work on Mount Tolmie: Amber, Ben, Colin, Jon, Lindsey, Annie, Chase, Jenny, Natalie, Nicole, Ouye, Jiarui and many more! Have a great summer and enjoy the beauty of the natural places on Vancouver Island!